Opt for many thin, warm layers, instead of a few bulky layers. This will insulate you better, and make it easier to regulate your body temperature by adding or removing layers. If you've found it to be unbearably itchy in the past, look for garments made with merino wool. It's a soft, non-scratcy wool. 3. Wear thicker socks or slippers. Keeping your feet warm will make your whole body feel warmer. This will warm you up while you're cooking, and warm you up again when you're eating the food you prepared. 5. Leave the oven open after you bake. This will allow the warm air to escape into the room. But only do this if you don't have any small children or pets in the house. 7. Drink lots of warm beverages. Keep coffee, tea, cider and hot cocoa on hand, so there will be something everyone enjoys. 8. Open curtains and blinds during the day to let the sun in. 9. Close curtains and blinds at night to keep out the cold. 10. Pile extra blankets on your bed. 11. Switch to flannel sheets and a down comforter. 12. Snuggle up in a blanket whenever you're sitting down. Better yet, snuggle with a pet or family member, so you can share body heat. 13. Wear a hat to prevent heat loss. A close-fitting cap will give you the best results. 14. Use a humidifier in any room you spend a significant amount of time in. Humid air feels quite a bit warmer than dry air. To avoid mold, set your humidifier to 40-percent humidity. Look for ultra sonic models that allow you to choose between warm and cold air. They cost more, but are well worth it. 15. Don't run the bathroom fan after you shower. The humidity will make the house feel warmer. Leave the bathroom door open after your shower, so that humidity spreads to other parts of your home. 16. Shut bathroom fans off as quickly as possible to prevent heat loss. 17. Reverse your ceiling fans. You want them to be turning at low speed in a clockwise direction during the winter months. This will help to push the warm air back down to the ground. 18. Put your clothes on as soon as they come out of the dryer. 19. Use rugs on bare floors to keep your feet warm. 20. Block drafts with weather stripping, rolled up towels or homemade draft stoppers. 21. 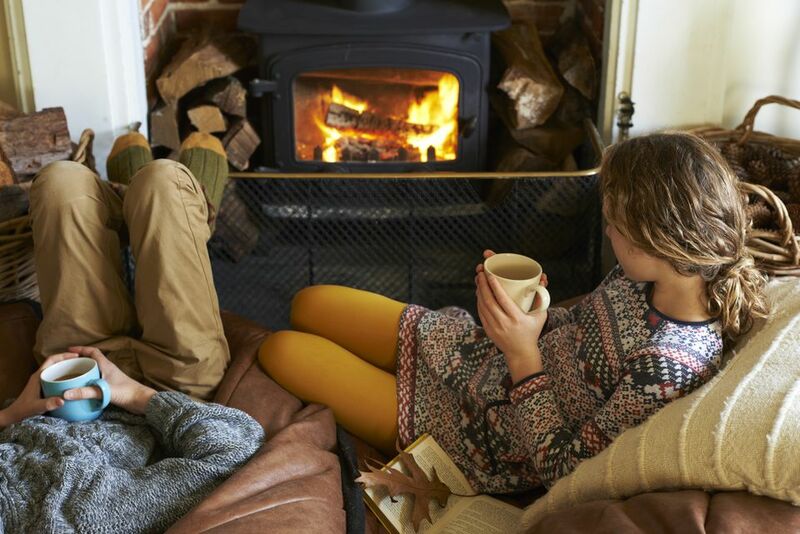 Keep your fireplace flue closed when you don't have a fire, to prevent unnecessary heat loss. 22. Make sure heat vents, registers and radiators are free of obstructions. 23. Use microwaveable heating pads to keep your hands and feet warm when you're sitting or laying down. You can make them yourself by sewing dried beans inside a piece of 100-percent cotton fabric. Just be sure to use 100-percent cotton thread, too. Microwave your heating pads for 30 seconds to heat them up. Here's a free heating pad pattern you can use. 24. Spend more time upstairs. Since hot air rises, the rooms will be warmer. Clean the house; exercise; tackle a home repair; play a game. Just find ways to keep yourself moving, so you generate more body heat. Can't Afford to Pay Your Heating Bill? Don't put yourself at risk by doing without. Here's how to get help with your utility bills.